One of the best resources I've found for learning about the Datsun 510 is the Bluebird mailing list archive. I subscribe to the mailing list, so I receive quite a bit of e-mail chatter regarding the Datsun 510 -- often more than I can or care to read. Fortunately, all of it conveniently archived and easily searchable. On a recent whim, I decided to go back to the earliest archived messages which are dated back to 1993. I clicked on a few messages from that year, and as I scrolled down, I happened to see a message thread titled Distributors and was curious if any mention of mechanical or vacuum advance was in that message. Instead, the message was actually about the fuel pump spacer -- something that I didn't even know existed on my car. That's because... my car didn't have one. If you read the message, you'll notice that without the spacer, the fuel pump ends up providing around 10 psi instead of the necessary 3.5 to 4 psi. That's more than DOUBLE the pressure that my carbs are meant to take! It's no wonder I've been running so rich, as evidenced by my constantly-green LEDs on my O2 gauge. Here's a shot of the fuel pump without the spacer. The pump is bolted directly to the head. It's a mechanical fuel pump and operates the same way a hand pump on a well would work. 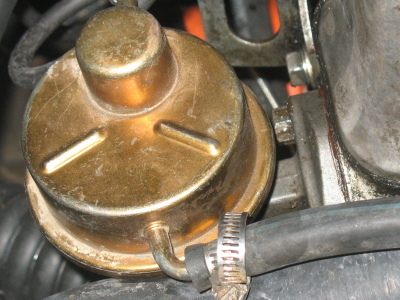 The pump is actuated by an off-center wheel attached to the camshaft, and as it spins, it forces fuel into the carburetors. 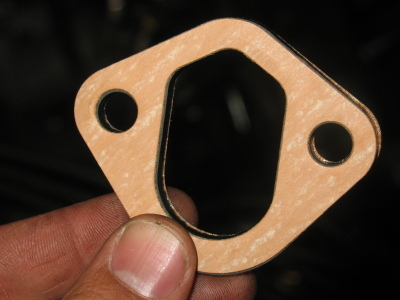 Here's the fuel pump spacer. It's 1/4" thick, and moves the fuel pump back that much, decreasing the amount of movement on the fuel pump arm. Apparently, it's not just a matter of limiting the amount of fuel being pumped in. 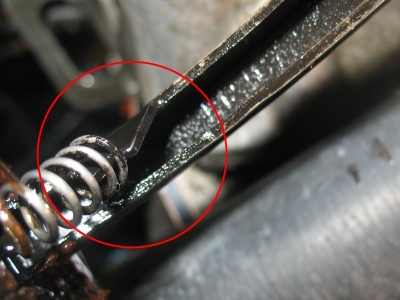 Sitting that close to the off-center wheel, and running at high rpms, the lever apparently collapsed where it connects to a secondary return spring. 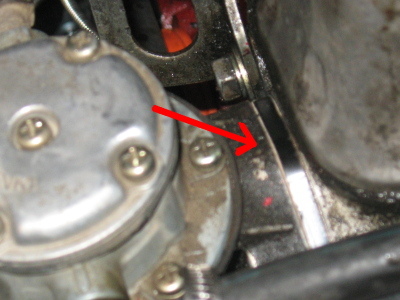 Here, you can see where the spacer is nestled between the head and the pump.